Valutata dagli ospiti dopo il soggiorno presso Effrosini Sea View. Excellent location, near the sea and near the city center (10 minutes walk), very clean and comfortable with all the comforts that a normal house can provide to you, very pleasant owner..excellent value for money... the apartment is in an old building but is completely renovated.. I think that rating speaks for itself. 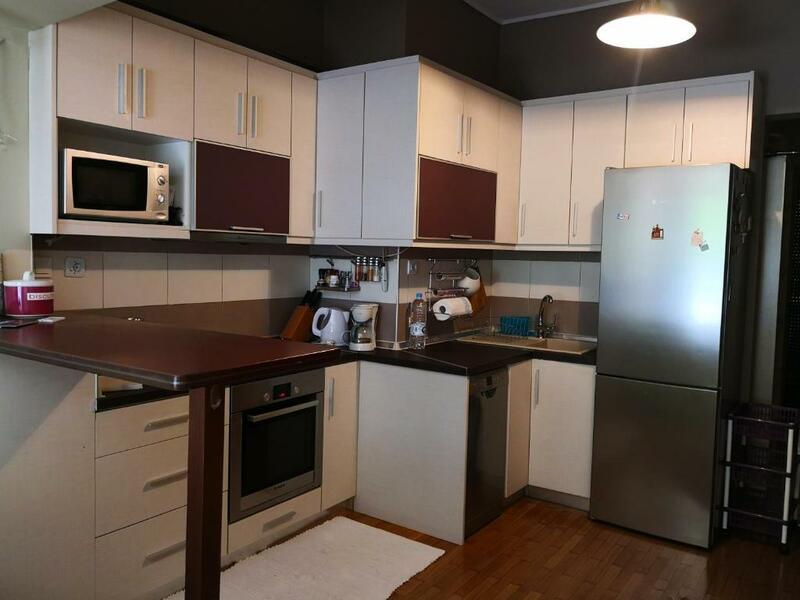 Apartment is nice and cozy, clean and at very good place that allows you to visit almost every interesting place at the city without using anything except your legs. Everything was amazing. Cozy and taken care of. The house smelled “new” all around, yet one always felt a really nice sense of warmth there. Location wise, it is perfect. Great hosts. Not to be missed. Besides the absolutely great location and cosiness of the apartment, I have really appreciated the friendliness and warmth of the host. Very helpful - our flight was delayed we arrived after midnight - we contacted the owner and the aunt came to let us in and give us the keys. Excellent location for Bay Area and cultural district. It was exceptionally clean! Everything smelled like it’s brand new. The apartment is comfortable and you have everything you need. The host was kind and stayed in touch until we arrived despite the fact he was out of town. The location is perfect - right behind the Statue of Alexander. Ωραίος χώρος γενικά Αρκετά κεντρικα Καλή θερμανση Κοντά σε συγκοινωνιες Ευγενική η οικοδέσποινα του σπιτιού. Excellent location, large apartment, excellent value for money. Ιδιαίτερα προσεγμένο σπίτι σε ήσυχο μέρος. Παρκαρεις το αυτοκίνητο μια φορά και έχεις πρόσβαση στο κέντρο της Θεσσαλονίκης με τα πόδια. Εξαιρετική φιλοξενία!!!! Assicurati un ottimo prezzo per Effrosini Sea View, valutato di recente dagli ospiti con un punteggio di 9,5. Uno dei nostri bestseller a Salonicco! Dotato di connessione WiFi gratuita, l'Effrosini Sea View sorge a Salonicco, a 500 m dal Museo Archeologico, a 1,5 km dalla Rotonda e dall'Arco di Galerio e a 1,7 km dalla Torre Bianca. L'appartamento dista 1,7 km dal Museo della Lotta Macedone. L'appartamento presenta una TV a schermo piatto, un'area salotto, una cucina con lavastoviglie e 1 bagno con doccia. Il personale della reception, aperta 24 ore su 24, parla tedesco e greco e sarà lieto di aiutarvi a pianificare il vostro soggiorno. La struttura dista 1,7 km dal centro espositivo di Salonicco. 15 km dall'Aeroporto di Salonicco, lo scalo più vicino. Quando vuoi soggiornare presso Effrosini Sea View? Appartamento con cucina, TV a schermo piatto e microonde. My house is modern, and everything is new inside. I live there normaly but my work is in the mountains, so i want to give it to people that want to explore my city. It is amazingly close to almost everything and not to close to the noise of the center. I have a friend that will welcome you from my neighbourhood, If you need anything she has an excellent taste of everything in Thessaloniki, and you are always welcome to call me if i can help you in something. Near to my place are, the museum of Vegina and Macedonia, the White Tower, Museum of Vizantio, the Helexpo of Thessaloniki, the historical center of the city, great Alexander and walking next to the sea. All of this 5minutes from my place. As well nice parks , super Market, 24 hours deli, bakeries, Bus stops and taxi stops to 1 min. Leggi prima di prenotare Effrosini Sea View accetta le richieste speciali. Aggiungile nel prossimo passaggio! Siete pregati di comunicare in anticipo a Effrosini Sea View l'orario in cui prevedete di arrivare. Potrete inserire questa informazione nella sezione Richieste Speciali al momento della prenotazione, o contattare la struttura utilizzando i recapiti riportati nella conferma della prenotazione.